Erected in the 17th century, the Armenian Church is an old heritage church, that will mesmerize you with its quaint characteristics. Apart from being one of the few Armenian churches of India, the church also “is one of the oldest churches of the Indian subcontinent”. The six belfries of the church are one of the most highlighted attributes of the church. Other significance of the church lies in the fact that there are graves of 350-odd Armenians that have been laid out throughout the property. This includes the grave of Reverend Haroutiun Shmavonian who was the founder, editor and publisher of the world's first Armenian publication “Azdarar”. The church is a sojourn of the few hundred Armenians that Chennai was once home to. How popular is Armenian Church? People normally club together The Forum Vijaya Mall and Railway Museum while planning their visit to Armenian Church. Incredible serenity and beauty (both physical and spiritual) in the middle of a crowded, hot city. Wish they had mass! Definitely worth spending some time to pray and rest here. The Armenian Church is located on the Armenian Street in George Town. 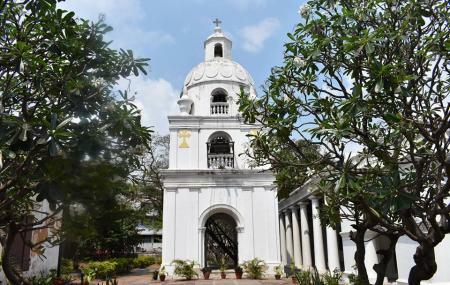 Constructed in 1712, thus making it one of the oldest churches of the Indian subcontinent, the Armenian Church is also known as the Armenian Church of Virgin Mary. The Armenian Church complex consists of a small chapel and a belfry tower. The chapel has a prayer hall with wooden seats arranged in front of an altar. A total of six metal bells are hung in the belfry. The bells are believed to be the largest and heaviest and have inscriptions to indicate the origin. The Armenian Church has also served as a cemetery and around 350 graves have been laid out throughout the complex. Today, though no services are held, the church is open to visitors of all faiths between 9.30 am and 2.30 pm on all days. Fort St George can also be clubbed while you are visiting the Armenian Church. Suitable for the whole family, the best time to visit the Armenian Church is between the months of October and February when the Chennai weather is at its best. Being in the heart of the city the Armenian Church is easily reachable by bus and cabs. One of the finest oldest historical church in heart of the city. Many foreigners visiting. But locals dont know its value. Its a gift. There is a historical bell there. The one and only unique church in earth.